Are you looking for a challenge beyond the typical road race and an event that will build lasting Team camaraderie...then you are ready for Peak to Brew. 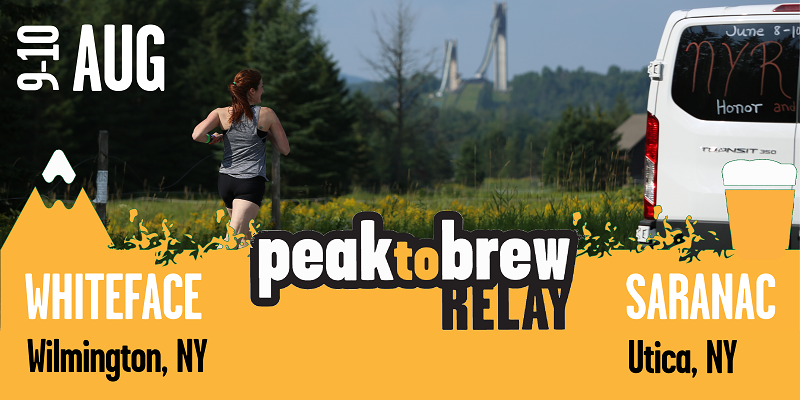 The Peak to Brew Relay is the Northeast’s longest most scenic overnight Team supported relay race at 220+ miles. Teams of 6-12 Runners and 1-2 Support Vans will traverse the course over 42 unique legs. The course will take Teams through the heart of the Adirondack Park and some of the most beautiful areas in the Northeast. From an epic Start at the summit of Whiteface Mountain Veterans Memorial Highway to an unforgettable finish and celebration at the historic Saranac Brewery, the Peak to Brew Relay is one of the most unique and challenging events in the Northeast. You + 11 Other Runners Split into 2 Vans conquering the 220+ mile ULTIMATE Relay course. Standard Team consist of up to 12 Runners split into 2 Vans that Leap Frog each other along the course. Van #1 Runners will run 4 separate Legs averaging ~20 miles in total distance, whereas Van #2 Runners will run 3 separate Legs averaging ~15 miles in total distance. You + 5 Other Runners Split in 1 Van conquering the 220+ mile ULTIMATE Relay course. Ultra Team consist of up to 6 Runners all in 1 Van where each Runner completes 7 separate Legs of the Course. Each Runner will average ~40 miles in total over the 7 Legs of the 220+ mile course. If you are looking for the ULTIMATE Challenge then the Ultra Team is for you. Same as a Standard Team with the only difference being you are only registering 1 Van and 6 Runners. We will then pair you up with another 6 Pack Team to make a Standard Team. Why do this? This provides Teams an avenue to participate that can not get 12 Runners together. It is also a great way to meet some new friends who share the same thrill of Relay running. If you think you will be faster or slower then the Required Team Pace not to worry, you can still compete if you are okay with being held at a Major Exchange if you are to fast or moved ahead if you are to slow...all hold or move ahead times will be subtracted or added to your Finish Time. NOTE: Minimum allowed participant age is 16 years of age by race day. Anyone under 18 will need to be accompanied by an adult over 21 and have a parent or legal guardian sign the waiver and registration. The Volunteer Requirement is a non-mandatory incentive based Volunteer platform. What does this mean? Teams do not have to provide Volunteers or go through the separate Registration Add-On for paying for Volunteers...NO HIDDEN FEES. Instead the overall Team Pricing has been structured to account for needed Volunteer support in working with local organizations and Charities. We will however provide an incentive to Teams who provide race day Volunteer(s). The Team Volunteer Incentive will be a $50 per Volunteer Discount off of the following years Registration. Volunteers will need to be registered under the Team on Run Signup by 31 July to be eligible for the discount. The discount code will be issued to the Team Captain after the event and once the volunteers have showed up on Race Day.